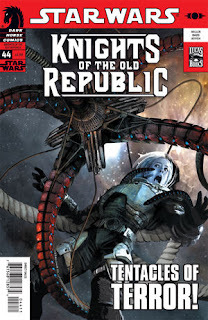 Faraway Press: The Online Home of John Jackson Miller: Knights of the Old Republic #44: Tentacle Wars! And my latest issue of Star Wars: Knights of the Old Republic hits stands this Wednesday — issue #44, the second part of "The Reaping," featuring one of the most unusual space combats we've presented. Surplus Republic warship over here; flying oil platform over there. But be careful which way you bet! I'll have some notes up about the story as soon as I can catch my breath. It's been a busy few weeks here, and they're about to get busier still. But there's always time to read a fun comic book, huh...?